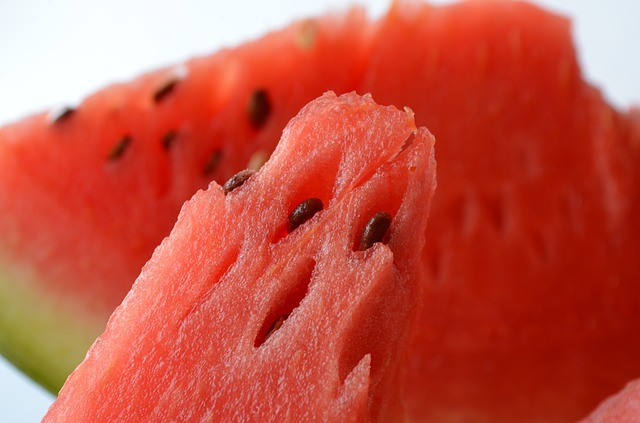 Home » Blog » Health Benefits Of Watermelon: Everything You Need To Know! Most people know watermelon as a delicious summer treat that they enjoy in hot weather and don’t think twice about the health benefits because watermelon is so delicious. It is common as a candy flavor, even as a sorbet flavor, and is now available as a popsicle, lollipop or even in juice and smoothies. It can be found as a liqueur and is popular to use as part of cocktail drinks in clubs and resorts around the world. But Did You Know That There Are Many Health Benefits to Eating Watermelon? 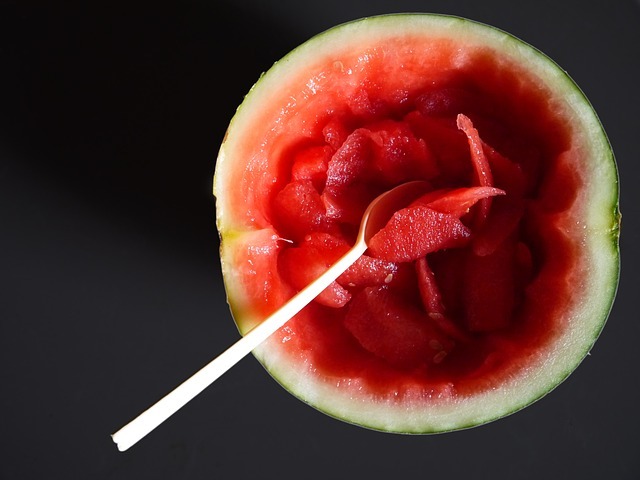 Most people like to eat the flesh of the watermelon raw or as part of fruit salad, or even in a drink, but usually discard the seeds, which are not as palatable to eat. While seedless watermelon is popular around the world as a result of genetic modifications to foods, you should not be so quick to spit them out, as there are also many health benefits to watermelon seeds. Watermelon is a type of fruit that grows on vine plants, and much like any other variety of melon contains seeds in its natural form. It has a thick husk-like crust and soft inner flesh that is usually brightly colored and sweet-tasting. 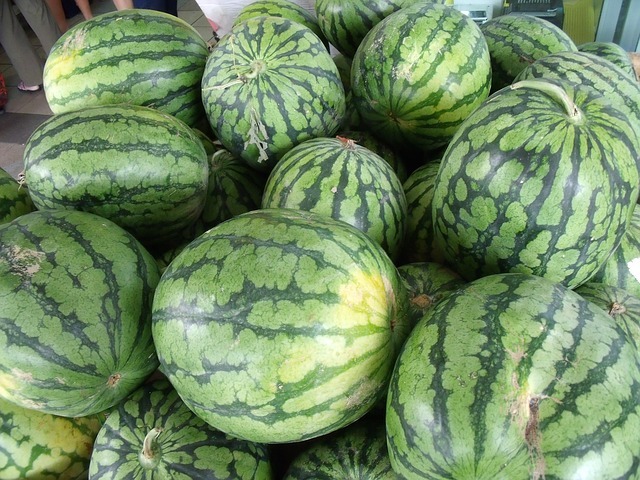 There are many varieties of melon available on the market, such as watermelon, tiger melon, cantaloupe, honeydew, and many other more rare melons. around the world and thanks to global exports of produce can be available in places where they do not grow naturally. As a result, they can now be found in supermarkets around the world and grow in plantations wherever a warm and mild climate permits. The top 5 producers of watermelon in the world are currently China, Turkey, Iran, Brazil and Egypt, but it can be grown in many other places around the world, mostly in South-East Asia, in the Middle-East and also in South America. Watermelon is normally a round or oval shape, but farmers in Japan have found a way to make watermelon even more novel, by growing watermelon in cubic form. These are more of a novelty type of watermelon and may be somewhat practical for storage, and even for cutting, but many people still prefer the round natural shape of the watermelon. In fact, they are generally considered ornamental because they must be harvested before they are ripe in order to turn them into a cubic shape, and therefore do not reach their familiar sweetness. Watermelon is known for its smooth surface and green tiger-striped husk, which contrasts with the bright red or pink insides. However, some watermelon is also yellow on the inside, or even white. These varieties are less popular and are more of a novelty, but are still available on the market and can be found around the world as they are growing in popularity as an alternative to the standard watermelon. Watermelon contains zero fat, and a very small amount of sodium. It is high in natural sugar, potassium, vitamin A, vitamin C and contains some magnesium, as well as negligible amounts of protein and dietary fiber. Watermelon contains citrulline, which is an amino-acid present only in watermelon and that has been linked to many health benefits such as improved heart health and lower cholesterol. It is available on the market as a supplement but is naturally available in watermelon. This amino-acid is also a vasodilator, which contributes to reducing blood pressure. Watermelon also contains lycopene, which is also available as a supplement on the market, usually extracted from tomatoes, and what gives the food its bright red color. It is also available in watermelon, papaya and red carrots. Lycopene is important for biosynthesis and helps the body absorb and integrate beta-carotene, which is important for the health of skin, hair and nails. Because the rind or crust of the watermelon is less sweet, it is generally not very popular to eat it, but it is indeed edible. Some people like to make it into a stir-fry or pickle the rind to make it more palatable and avoid wasting the husk, and sometimes people marinate the rind in liquor and eat it as an alcoholic treat. Much like cucumbers, other melons and many fruits, melons are excellent for rehydration as they contain a significant amount of water as part of their makeup. In fact, watermelon is 6% sugar and 91% water, which makes them an ideal way to rehydrate the body. All other vitamins and nutrients are in a smaller portion, but there are nonetheless many health benefits to watermelons. Some of those health benefits are related to vitamin C and low sodium content, as with most fruit, but there are also health benefits related specifically to watermelon. Watermelon has been shown to improve heart health and control weight gain or maintain a healthy weight in mice, which suggests that these health benefits are transferable to humans as well. The benefits include a lower arterial plaque and lower cholesterol, which are linked to improved heart health as well. Because watermelon is so low in calorie count it is also a great snack to boost blood sugar levels between meals without cutting your appetite. Watermelon only contains about 40 calories per cup of watermelon, which is very easily digestible. It may spike blood sugar levels in the short term, but unlike a snack with too many carbohydrates or refined sugars, watermelon is a great low-sodium and healthy way to snack, especially in the summer time. Watermelon juice has been linked in some studies to relieving muscle soreness, particularly after working out. The make-up of watermelon, the amount of water, and sugar are excellent for rebalancing electrolytes and make it especially beneficial after a workout or when the body is overheated from sun exposure as well. This is linked to the citrulline contained in watermelon, which is related to lower blood pressure. Because watermelon is, as its name suggests, so full of water, juicing it is also great to relieve any conditions related to dehydration. This can include fatigue, poor digestion, headaches, poor concentration or mental dullness, as well as mood swings. 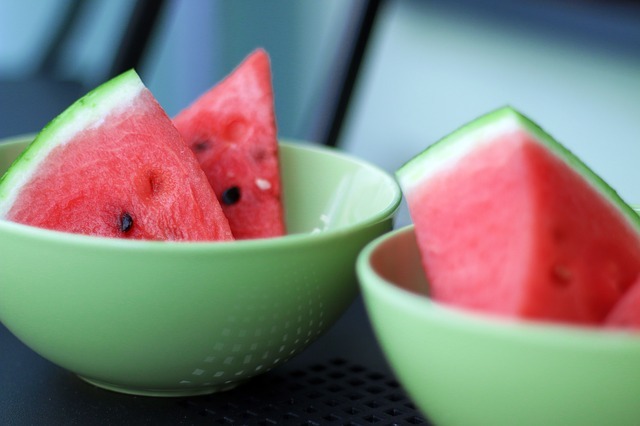 Watermelon is great for improving this in the short term, and when consumed regularly can help keep the body hydrated. Along with water, watermelon juice is a great way to rehydrate the body regularly and quickly. Aside from watermelon juice, another great way to consume watermelon is by adding cubes of watermelon to water. This is great as a smoothie base, as well as to add the delicious flavor of watermelon to your water and to help keep hydrated. Watermelon seeds also contain some health benefits that most people overlook as they are not as enjoyable to eat.However, watermelon seeds can be an excellent source of protein, vitamin B, minerals and healthy fats. For this reason, it is becoming more common to find watermelon seed oil on the market, which can be used to integrate more of these health benefits into your regular diet. As with any food, it is important not to go overboard. Watermelon is healthy when consumed regularly, but if consumed in excess, can result in too much lycopene or potassium in the body. For someone with excess lycopene or potassium, consumption of watermelon should be limited to no more than one cup of watermelon a day to ensure that the levels do not increase. In addition, as with any fruit, people with high blood sugar, or suffering from diabetes should be aware of the natural sugars contained in fruit and enjoy a mindful consumption of fruit as per their doctor’s recommendations, to avoid sugar spikes in the blood sugar levels that would negatively impact them.